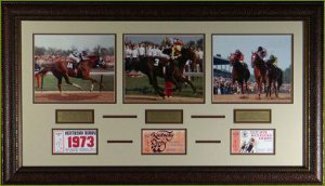 This is a Triple Crown Champions Display with Photos by Secretariat (1973), Seattle Slew (1977), and Affirmed (1978). This is Museum Quality Premium Leather Framed as shown to an overall size of 22x29". Also custom framed with 3 replica derby tickets and descriptive plaques that further enhance this unique display. The Triple Crown is an unofficial championship attributed to a Thoroughbred horse that in a single season wins the Kentucky Derby, the Preakness Stakes, and the Belmont Stakes.